There is a remarkably exotic quality about this painting, but although Miro enhanced the effect by one of his familiar eye creatures, he nevertheless took a completely novel direction with it. This can be seen in his very choice of colours, with shades that are totally untypical of Miro. There are the light purple stripes on a black surface in the shape on the right, a shape that looks like an African shield, and different hues of yellow and orange against a broken surface. 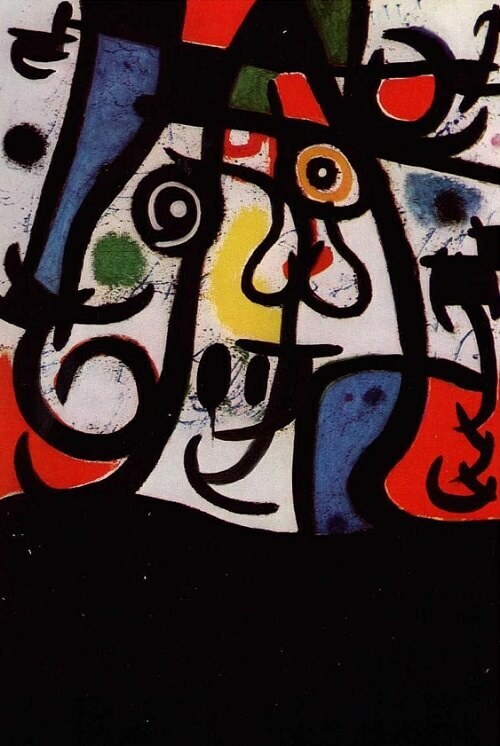 This is a degree of variety which is rare in Miro's art. The eye creature itself is composed of a small number of basic, geometrical shapes, whose overlaps give it a primaeval posture so that it appears both highly subjective and at the same time universally meaningful.